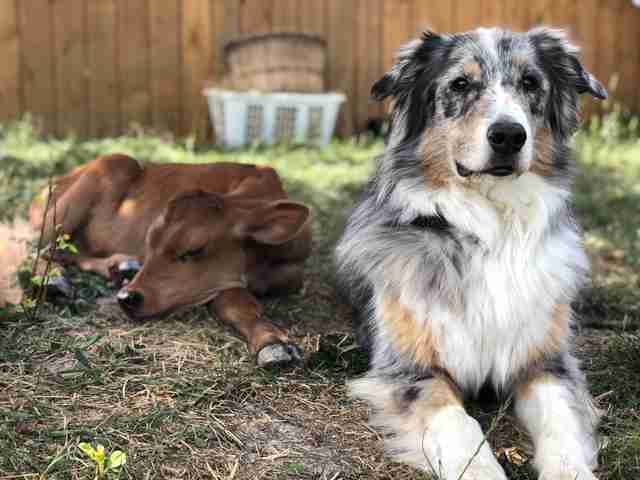 He could tell the little calf needed someone to watch over him. 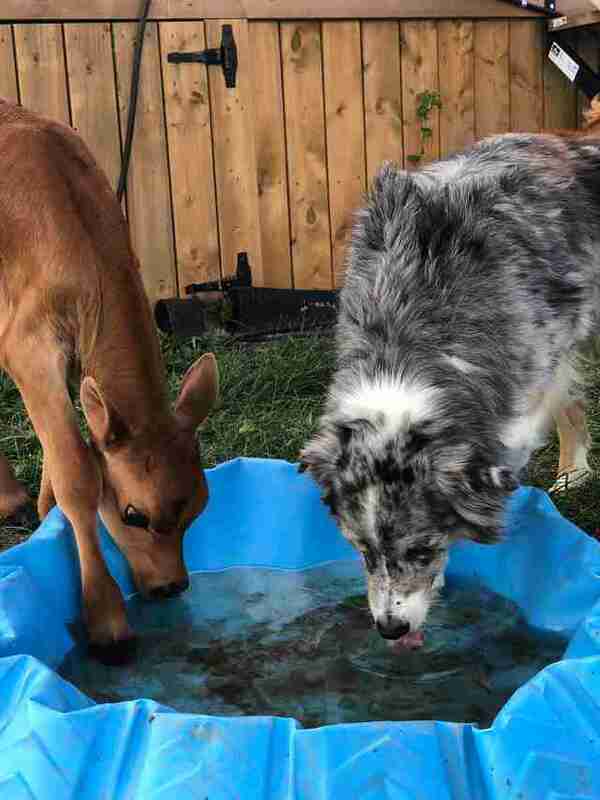 Just several hours after Calvin, a tiny calf, was born, he and his mom were separated. That's because Calvin's mom is a dairy cow living on a large industrial dairy farm in Canada. 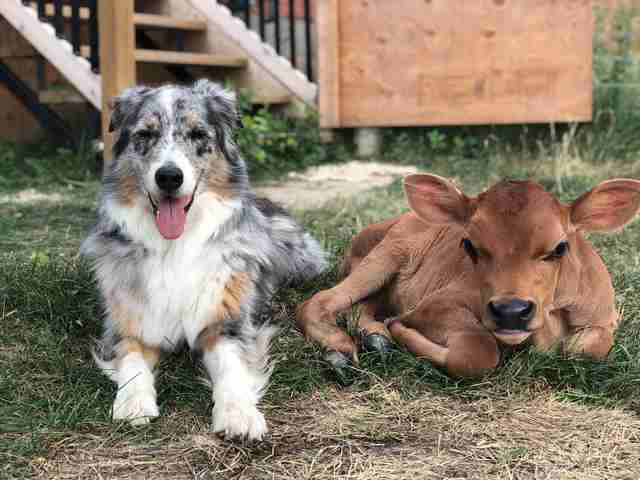 "He was taken from his mom at 2 days old and put in a little concrete pen," Megan Mostacci, cofounder of Black Goat Farm and Sanctuary in Ontario, Canada, told The Dodo. 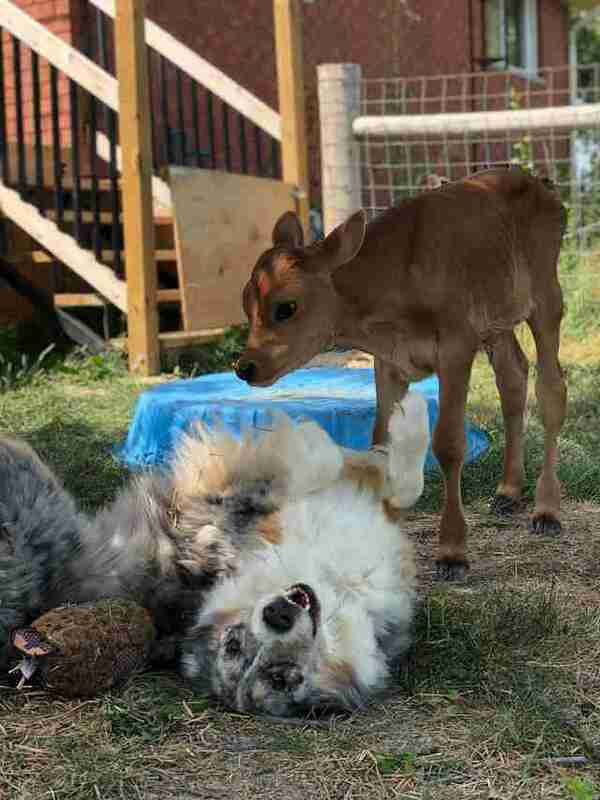 In order to keep producing milk, dairy cows have to give birth. 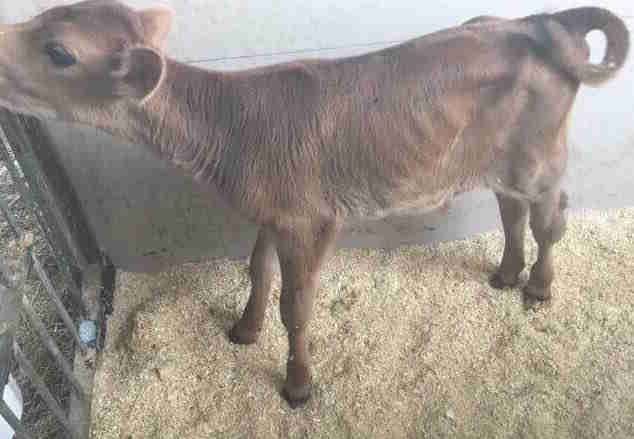 But, sadly, this leaves a lot of unwanted calves like Calvin, who end up being sent to slaughter. A very early death would have also been Calvin's fate — but a few people were determined to save him. They spoke to the farmer and asked him to spare Calvin's life. On Thursday, Calvin arrived at Black Goat Farm and Sanctuary, where he was allowed to step outside in a field for the first time. As soon as he was let outside in the sunlight, Calvin simply could not contain his joy — he started running and jumping around on the fresh grass. "He never got to go outdoors or stretch his legs and just run!" Mostacci said. "You can see how much he loves running." The pleasant surprises didn't stop there. 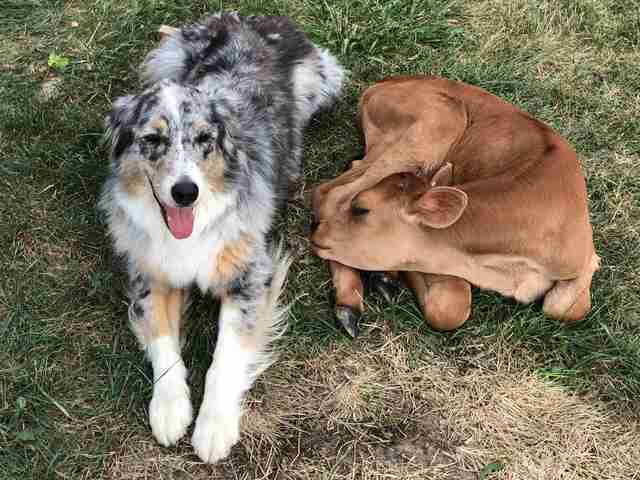 Two dogs also live at the sanctuary, and they have taken on important roles helping raise the animals their humans rescue. 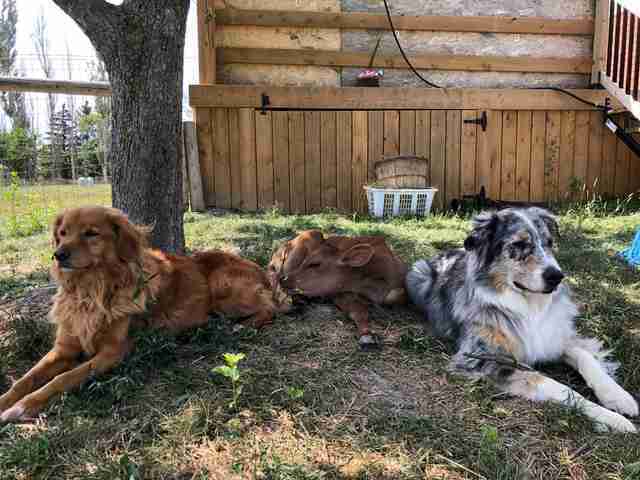 Drake, a Nova Scotia duck tolling retriever, and Lincoln, an Australian shepherd, were introduced to Calvin — and they swiftly took the new resident under their wing — or, rather, paw. The first time Calvin was ever allowed outdoors, the dogs were by his side, helping him get adjusted to his happy new life. Lincoln, who seems to have especially bonded with the new calf, decided to give him a little bit of a tongue bath. When Calvin drifts off to sleep, Lincoln keeps watch over him, as if intuiting that Calvin, at just 2 weeks old, has already been through enough hardship and should be allowed to rest. 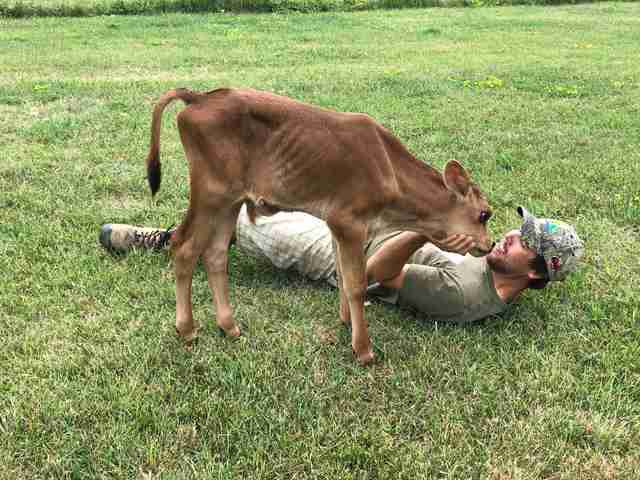 It's hard to imagine that such an important member of the sanctuary family almost didn't live to see the sun or run in the grass or meet his new best friends. 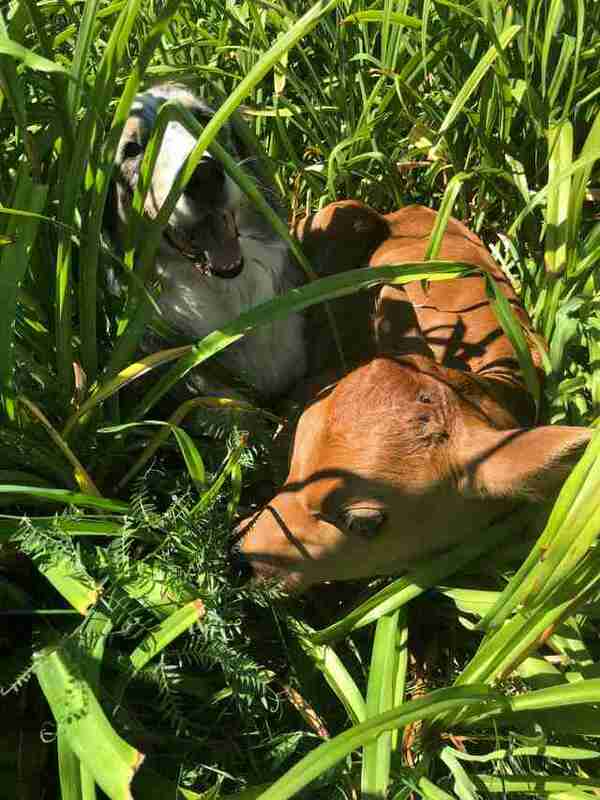 "The males are generally considered worthless [at dairy farms]," Mostacci said. 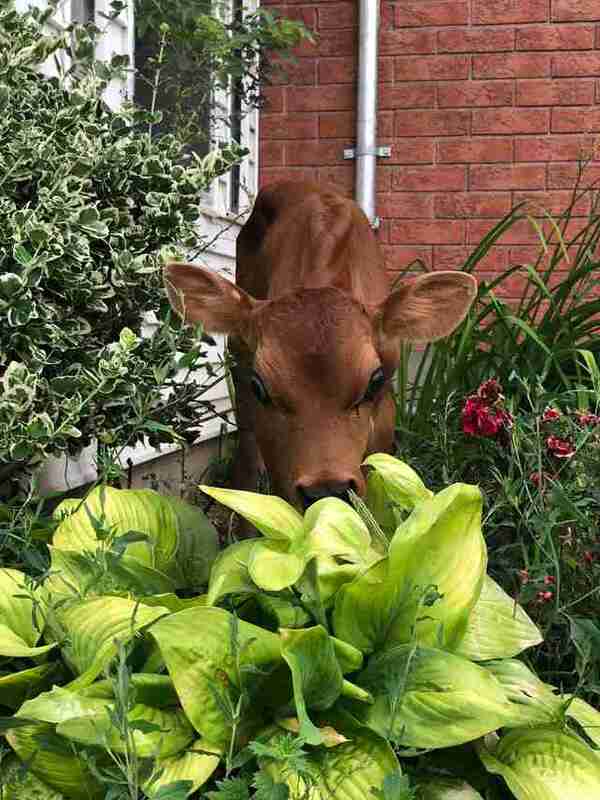 "And, sadly, with Jersey cows — Calvin's breed — they are usually killed right away." The sweet moments of levity between Calvin and Lincoln are also extremely meaningful, not just for Calvin, who will probably never see his mom again, but also for Mostacci and her husband; it helps them remember why they started the sanctuary even in the more difficult times. "We see the suffering and neglect that these poor helpless animals endure and we feel heartbroken along with them," Mostacci wrote on Facebook. "We save some — but we also see all the ones who cannot be helped. Sometimes it feels like we are fighting a losing battle." This week, Mostacci and her husband planted a weeping willow in a patch of yard where they will bury some of the animals they couldn't bring enough strength to. "It was a hard moment," Mostacci wrote. 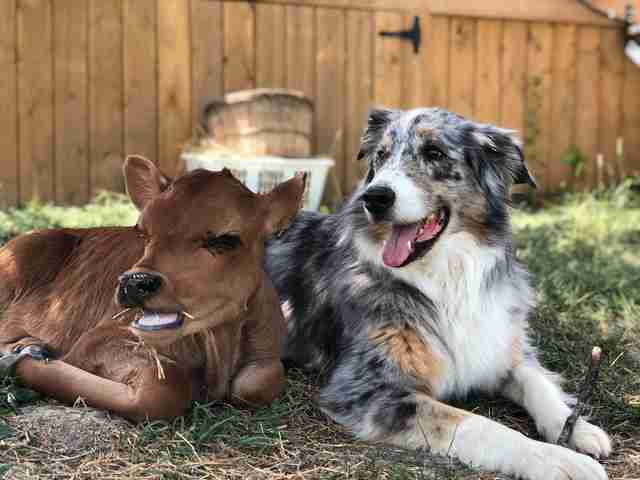 But Calvin was there — and little did the tiny calf know, he was making a big difference for the people who saved him, just by being himself. "He was running and playing — full of joy and life," Mostacci wrote. "He is one of the lucky ones. He is a reminder of why we do this." 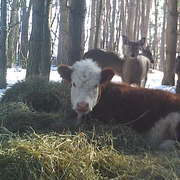 You can help Calvin and his rescued friends by making a donation to the sanctuary. You can also follow their adventures on Instagram.